Zombie banking has become standard operating procedure for big debtor nations. They prop up failing institutions, print money, and avoid financial corrections. But in an attempt to prolong the inevitable, bigger problems are created. The approach used now has not, and will not, work. This timely book reveals why. Zombie Banks tells the story of how debtor nations and failing institutions are damaging the long-term prospects of the global economy. 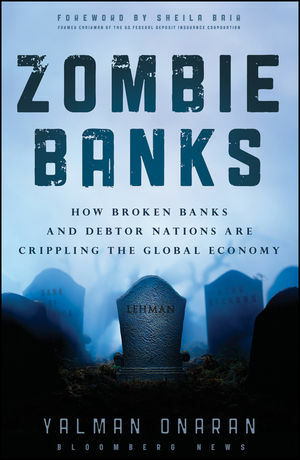 Author Yalman Onaran, a veteran Bloomberg News reporter and financial banking sector expert, examines exactly what a zombie bank is and why they are kept alive. He also discusses how they hurt economic recovery and what needs to be done in order to restore stability. Along the way, Onaran takes an honest look at how we arrived at this point and details the harsh realities that must be faced, and the serious steps that must be taken, in order to get things headed in the right direction. While the short-term measures taken to stave off depression and rejuvenate economic growth may offer hope, they are unsustainable over the long term. Get a better look at what really lies ahead, and what it will take to improve our economic situation, with this book.